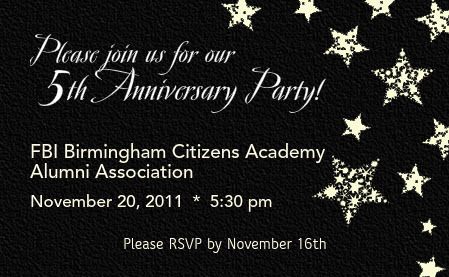 The FBI Citizens Academy Alumni Association celebrated its 5th Anniversary with a holiday party at The Wine Loft in Birmingham. Alumni and friends from Birmingham and Huntsville Citizens Academy classes took the opportunity to honor Paul Daymond, FBI Community Outreach Specialist, for his unselfish service to our organization since our inception. Everyone had a wonderful time! Click here to view the photos from the event!